Who doesn’t enjoy a story where children are heroes, good triumphs over evil and animals talk? The Gilbert Theater delivers all that and more with its production of “The Lion, the Witch, and the Wardrobe,” playing through April 21. The show is based on C.S. Lewis’ classic tale from “The Chronicles of Narnia.” This story is the second in the series but the first that was published. It introduces us to the four Pevensie children: Peter (Adam White), Susan (Helen Steffan), Lucy (Mia Buracchio) and Edmund (Joshua Brunson). When young Lucy explores an old wardrobe, she finds a magical entrance, marked by a lamp post, to the land of Narnia. In Narnia, the White Witch (Nicki Hart) rules with fear and makes it “always winter and never Christmas.” Declaring herself Queen of the Realm, the White Witch turns anyone who betrays her to stone. The good inhabitants of Narnia, including talking beavers and a faun, unicorn and centaur, live in fear and wait for the return of the lion Aslan, the true king of Narnia, who can make things right. When “daughters of Eve and sons of Adam” (humans) arrive in Narnia, the White Witch tries to capture the children to prevent them from fulfilling a prophecy that they will sit in the four thrones in the castle of Cair Paravel and end her reign. In the process, the White Witch tricks young Edmund into helping her. When Aslan (Ja’Maul Johnson) arrives, he leads the children and Narnia animals in a fight against the White Queen. There are chases, sword fights and battles — all carried out on the Gilbert stage by a cast of all ages. 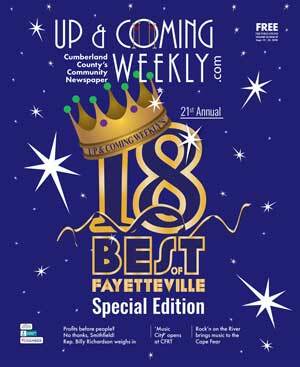 Director Brian Adam Kline brings together this exciting story with an exceptional cast, demonstrating that for Fayetteville talent, there is no age limit. The collective cast is to be commended for bringing the fantasy to life. 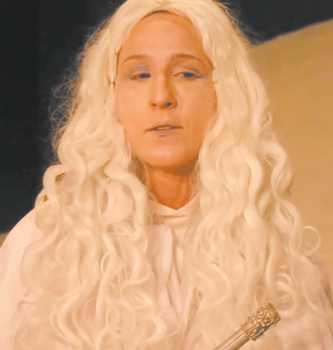 Hart, as the White Witch, steals every scene she is in. She is wicked and marvelous at the same time. Hart brings to her portrayal a steady fierceness — whether acting opposite Johnson’s Aslan or Brunson’s Edmund. Nine-year-old Brunson gets kudos, for sure. Also impressive are Buracchio, Steffan and White as Lucy, Susan and Peter. The trio collectively have quite a bit of stage experience, and it shows, despite their ages that barely reach double digits. Also noteworthy is Cheleen Sugar’s performance as Fenris Ulf, a talking wolf and chief of the White Witch’s secret police. Sugar brings a slick and stylish quality to her portrayal — what I imagine it would be like if Lewis had written a rock star into Narnia. Other highlights of the show include Quentin King and Jane Moran as Mr. and Mrs. Beaver, and Brandon Bryan as Mr. Tumnus, the faun. The story hardly slows down from beginning to end. Battles are fought, sacrifices are made, and kings and queens are crowned. Forgiveness and courage are highlighted in this family-friendly show. 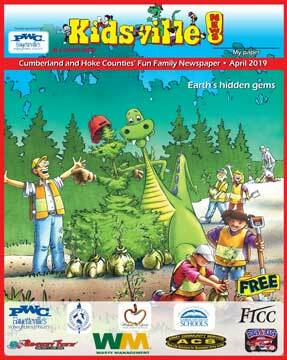 Audiences of all ages will enjoy the production. “The Lion, the Witch, and the Wardrobe” runs through April 21 at Gilbert Theater. Call 910-678- 7186 or visit www.gilberttheater.com for tickets and information. Photo: Nicki Hart, as the White Witch, steals every scene she is in. 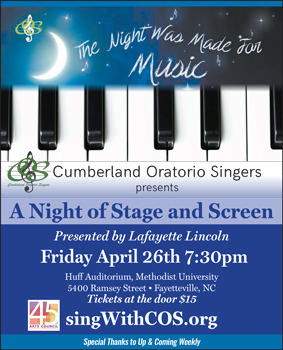 Friday, April 26, the Cumberland Oratorio Singers close their 2018-19 concert series. At the Matthews Ministry Center in Huff Auditorium on the Methodist University campus, COS, under the direction of Jason Britt, presents “A Night of Screen and Stage.” COS wraps up its 27th performing season by highlighting musical numbers from Broadway and Hollywood productions. According to the COS website, musicals originated in France in the 1800s where they were called “Opera Comique,” distinguishing them from the traditional opera of Wagner et al. George Bizet and Jacques Offenbach were notable among those composers who contributed to the genre that would become the modern-day musical. Wikipedia gives credit to the 19th century works of Gilbert and Sullivan in Britain and Harrigan, and Hart in America, for contributing many structural elements to the genre, as did the later works of George M. Cohan. In the 20th century, musicals moved beyond comedies and revues. Modern-day musicals such as “West Side Story,” “Les Miserables,” “Rent” and “Hamilton” call for considerable character development in addition to memorable musical scores. Featured in Friday night’s performance will be well-known songs from “Man of La Mancha,” “Singing in the Rain,” “Chicago,” “Charlie and the Chocolate Factory” and “White Christmas,” among many others. Soloists are yet to be determined and will be selected from the choir before the evening’s concert. In the interest of continuing professional caliber choral music in Cumberland County into the next generation and beyond, under the COS umbrella, the Campbellton Youth Chorus is open to all Cumberland County and Sandhills region youth ages 9-14. “The CYC provides vocal development, music literacy and unique performance opportunities,” according to the COS website, where further information about rehearsals and other opportunities can be found. “A Night of Screen and Stage” begins at 7:30 p.m. Tickets may be purchased at the door for $15 for adults and $5 for students with ID. Season tickets will also go on sale for the 2019-20 concert series at $45 per ticket. Visit www.singwithcos.org for more information. No matter which side of the pro- or anti-gay marriage fence you fall on, “The Cake” is an entertaining and touching look at how people can disagree and still treat each other with respect and love. 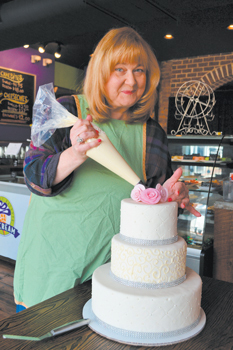 “The Cake,” showing at the Cape Fear Regional Theatre through April 21, introduces us to Della (played by Libby McNeill Seymour), a sweet, Southern woman who owns a bake shop in Winston- Salem. When Jen (played by Jessica Giannone), the daughter of Della’s deceased best friend, returns home to North Carolina to get married, she asks Della to bake a wedding cake. Della is thrilled — until she finds out that Jen is marrying another woman, Macy (played by Olivia London). First, let me say — it’s not about the cake. Second, it is refreshing to see a production like “The Cake” that shows the struggle on both sides of the topic of gay rights. The public discourse on disagreeable topics has turned so ugly and disrespectful, it often results in outright dismissal of another’s beliefs simply because we don’t believe the same. We see a little piece of that in “The Cake,” when one character uses coarse language to unsettle another character’s almost biblical sense of propriety. Onstage, it’s a good thing, because it gets us thinking. It gets us talking about how rude or how spot-on it can be to unsettle someone or disparage their belief system. Since I’m a big believer in theater as a venue for opening public discourse on tough topics, I applaud CFRT’s willingness to continue to do just that. Unlike last season’s “Disgraced,” which took a serious look at Islamophobia, “The Cake” offers a dash of laughter and a pinch of self-reflection. Seymour does an outstanding job of portraying Della, who is forced to question her religious beliefs as she struggles with deciding whether or not she should make a cake for a gay wedding. 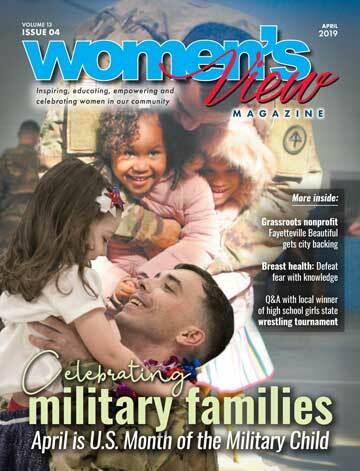 Her decision could jeopardize her relationship with Jen, who is like a daughter to Della. Also spotlighted is Della’s marriage to Tim (played by Greg King), who is opposed to his wife participating in a gay wedding. Seeing Seymour and King onstage together again is a treat. Both are CFRT veterans and last appeared together in “Sense and Sensibility.” I give readers fair warning, no matter how much you’ve enjoyed King’s performances in the past, after “The Cake” you will not be able to look at him (or mashed potatoes) the same again. Giannone and London bring vulnerability couple who want to love and be loved being judged. Playwright Bekah Brunstetter doesn’t try to present an answer to the hot-button topic of gay marriage in 90 minutes. What she does is deftlypresent the dilemma on both sides of the topic. Brunstetter, who is from Winston-Salem, has publicly discussed how the play reflects her own dilemma of reconciling her Southern Baptist upbringing with her adult life in New York and Los Angeles, where her political beliefs are often pitted against a vilified version of the kind and caring people she grew up with in North Carolina. Don’t expect any big, dramatic character shifts that fix all the problems and settle all the disagreements. That is not how real life usually works. Sometimes, the biggest, most difficult step is just finding enough common ground to begin the conversation. “The Cake” is directed by David Hemsley Caldwell and runs through April 21. For tickets or information, contact the box office at 910-323-4233 or visit www.cfrt.org. Instead of receiving unwanted catalogs and junk mail, imagine going to the mailbox and finding an original artwork the size of a postcard, addressed to you, from someone who lives in Bulgaria. Now imagine receiving five to six postcards each day, until you have more than 80, from strangers who live in our region, nationally and internationally. That’s the process that took place for “STOP IT! An International Mail Art Exhibition,” opening Tuesday, April 23, at Gallery 208, 208 Rowan St. The exhibit is traveling from Fayetteville State University’s Rosenthal Gallery, where 85 works were exhibited this March after a call for art went out in December 2018. The call for art invited women from around the world to participate by creating an image on a postcard that illustrates any local, national or international issue of their concern. They were then directed to send it through the mail to its destination: Fayetteville, North Carolina. The work was not sent to the gallery in an envelope. Instead, artwork had to go through the postal system in the postcard format and have an authentic postal stamp on its front or back upon arrival. As it went through the postal system, coming from another country or locally, every postal employee whose hand touched the card could see the work before it arrived at the gallery. In this way, all those postal employees were part of the mail art process. Creating works of art on postcards and sending them in the mail to someone, a practice that started in the 1950s, became known as mail art and had grown into a movement by the ’60s. Although social media can appear similar in some ways to mail art, what makes mail art different is the tactile experience of opening your mailbox and the surprise of receiving something created for you. It is not considered mail art until it is delivered to the post office. The purpose of mail art, then and now, is the creation of an inclusive scope that allows any artist to participate. Mail art artists appreciate the challenge of working on the limited postcard size along with the interconnection with other artists within a medium that promotes an egalitarian way of creating. The mail art process sidesteps entry fees, the art market and galleries. “STOP IT!” is a different type of gallery experience. The exhibit represents the voice of a collective coming together to have their voices heard in an art form. All the participants in the exhibit became part of a nonhierarchical, uncensored call for art and social activism by addressing any concern they have for a local, regional, national or international issue that needs to be stopped. Visitors should plan on spending time in the gallery. The works are small, and many artists have written text on the stamp side (which is also displayed). As the postcards arrived at the gallery, it became evident there were repeated issues of concern. At the discretion of the curator, liberty was taken to group the work into themes to create a sense of order in the gallery space. Eightyfour works are grouped by themes and also by geographic location — regional (Virginia, North Carolina and South Carolina), national and international. As a collective, the concerns of the women in “STOP IT!” fall into the following categories: stopping violence against women and children; environmental issues; the empowerment of women and individuals; cultural awareness; politics; mental and physical health; and the influence of technology on identity. Whether it is Suzanne Coles from Michigan, who addresses homelessness through the medium of photography, or Shennaire Williams from Jamaica, who addresses human trafficking with a computer-generated image, each artist is part of the collective voices of women. Many artists, like Radosveta Zhelyazkova from Bulgaria, focused on stopping violence against women and children. Zhelyazkova sent in two acrylic paintings, each a portrait of a woman. The figure on the card reflects on stopping violence against women. 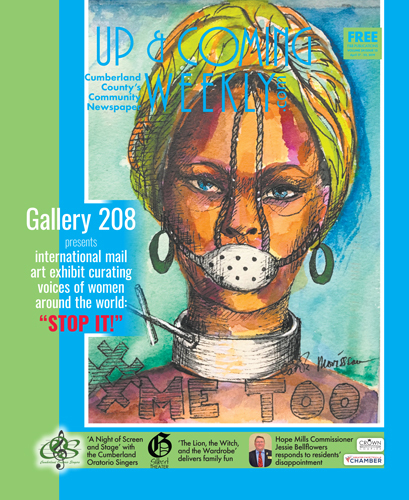 Six local artists created original works in a variety of mediums to address this same issue: Angela Stout, Ria Westphal, Tracy O’Conner, Missy Jenkins, Leslie Pearson and Jacqueline Caldwell. Many artists in the exhibit addressed the issue of saving the environment. Alexandra Uccusic from Vienna sent an original drawing to illustrate stopping the exploitation of the seas. Katsura Okada from New York created a mixed-media collage addressing the problem of the way plastic kills sea life. Several local artists sent in beautifully crafted works about saving the environment: Susanna Davis, Rose-Ann San Martino, Nordea Hess, Manuela Smith and Martha Sisk. Many national and regional artists addressed themes of empowerment and identity. Two high school students, Bryanna Rivera and Alyssa Mincey, addressed discrimination toward identity and how technology influences a sense of identity. Kyle Harding, a high school art teacher, also addressed the issue of technology’s influence on a student’s identity. There are too many wonderful works within many themes and too many artists to mention them all in this short article. There will be plenty of time for visitors interested in seeing “STOP IT!” at Gallery 208, since the exhibit will remain up until mid-June 2019. The public is invited to the opening reception of “STOP IT!” Tuesday, April 23, at Gallery 208, located at 208 Rowan St. The opening reception will be 5:30-7 p.m., and many of the local artists who participated in the exhibit will be there. The gallery hours are Monday through Friday, 9 a.m. to 5 p.m. For more information, call 910-484-6200. Cape Fear Regional Theatre introduces “The Cake” to the stage April 4-21. “The Cake” tells the story of a Southern belle named Della (Libby McNeill Seymour) who owns a bake shop in Winston-Salem, North Carolina. Della’s worldview is brought into question when Jen (Jessica Giannone), the daughter of Della’s deceased best friend, travels from New York to request a cake for her wedding. When Della learns Jen is marrying another woman (Olivia London as Macy), she must choose between her traditional values and the love of an old friend. “The Cake” was written by NBC’s “This Is Us” supervising producer and University of North Carolina at Chapel Hill alumna Bekah Brunstetter. It is directed by David Hemsley Caldwell. 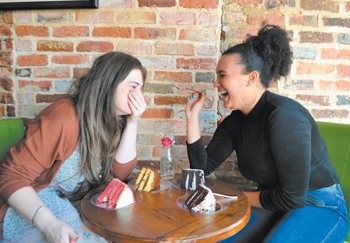 CFRT is one of the first regional theaters to present “The Cake,” which will wrap up its acclaimed off-Broadway run at the Manhattan Theatre Club in New York City just a few days prior to its debut in Fayetteville. According to the actors, this is a show for all people, but don’t expect to leave without first considering your neighbor’s point of view. “The themes of the show are acceptance, trying to find a middle ground, coming to terms with people who might think differently than you,” said Caldwell. Like Della, who, according to Seymour, must “(think) about alternative points of view in the world,” audience members may experience a shift of perspective. Greg King, who plays Della’s husband, Tim, emphasized this middle ground alongside Caldwell and Seymour. “Everyone that comes to see the show is going to feel that they can identify with an opinion that they see onstage,” he said. Regardless of beliefs, most play-goers will enjoy that “The Cake” is being catered by The Sweet Palette, who will provide cake for the show itself and then for audience members following each performance. London looks forward to the conversations the post-show desserts will accommodate. “(It’s) an opportunity to talk about what they just saw, (which) opens up the opportunity for them to talk about different opinions or a different takeaway,” she said. CFRT welcomes service members and their families, along with the public, to its Military Appreciation Night performance Wednesday, April 10, at 7:30 p.m. Playwright Brunstetter will attend the show and stay afterward for a talk-back with the audience, in which she’ll answer questions about the show and her career. Though military discounts are available for every performance at CFRT, the Military Appreciation Night discount will be 25 percent, the lowest of the year. CFRT is located at 1209 Hay St. For tickets or for more information, contact the box office at 910-323-4233 or visit www.cfrt.org. The performance runs Wednesdays through Fridays at 7:30 p.m., Saturdays at 2 p.m. and 7:30 p.m., and Sundays at 2 p.m., with tickets at $25. 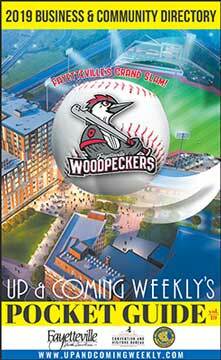 Preview nights are April 4-6, with tickets at $15.